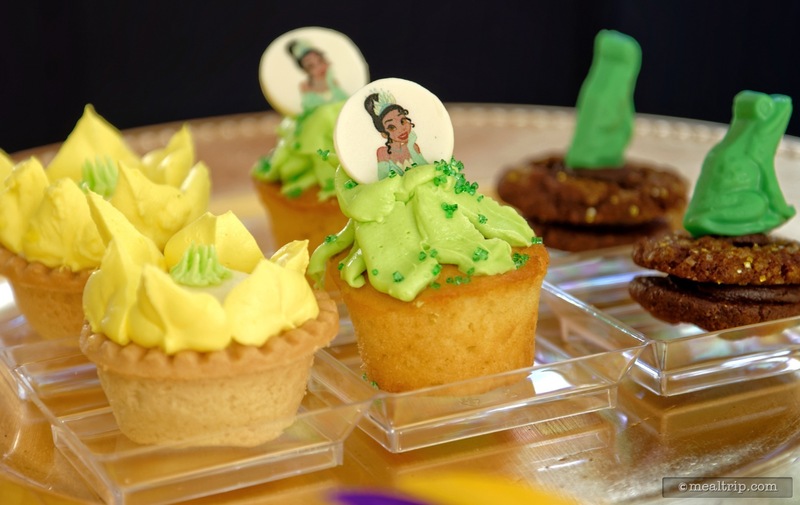 Tiana's Riverboat Party combines a daytime dessert and ice cream party with a character meet and greet (namely Tiana and Naveen) and tosses in a unique Festival of Fantasy parade viewing location for good measure. 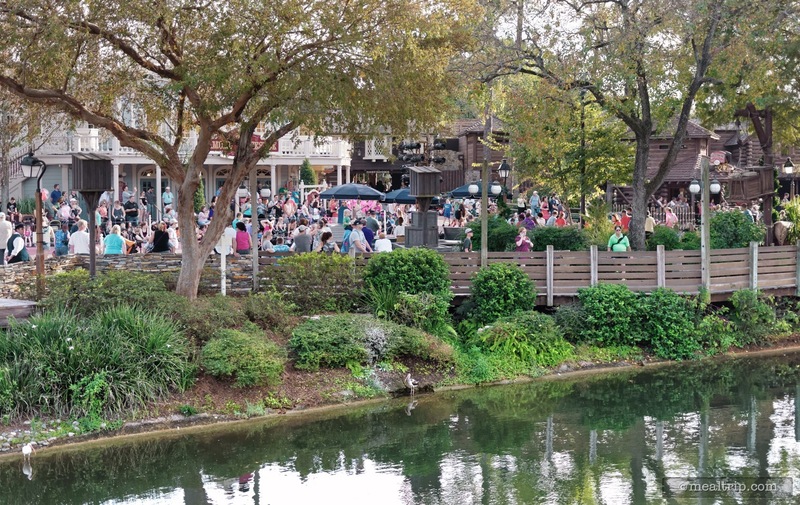 The event takes place (mostly) on the Liberty Square Riverboat and is around 90 minutes in length (give or take). Check-in for the $49 per adult (and $29 for children 9 and under) event is located directly outside the Liberty Square Riverboat dock. A photopass photographer is on-hand for the two opportunities that you'll get to meet with Tiana and Naveen, once on the landing before the parade, and once again on the Riverboat after the parade. While the dessert and ice cream selection may change a bit seasonally, it should stay very close to the menu listed below, which was available during the first few sailings of the Riverboat Party. 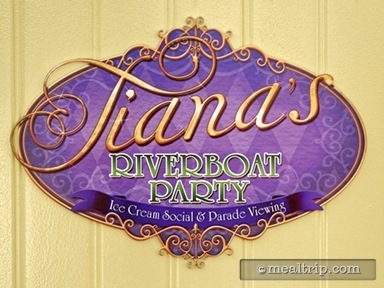 Tiana's Riverboat Party is a new (paid) special event in the Magic Kingdom that takes place on and around the Liberty Square Riverboat. 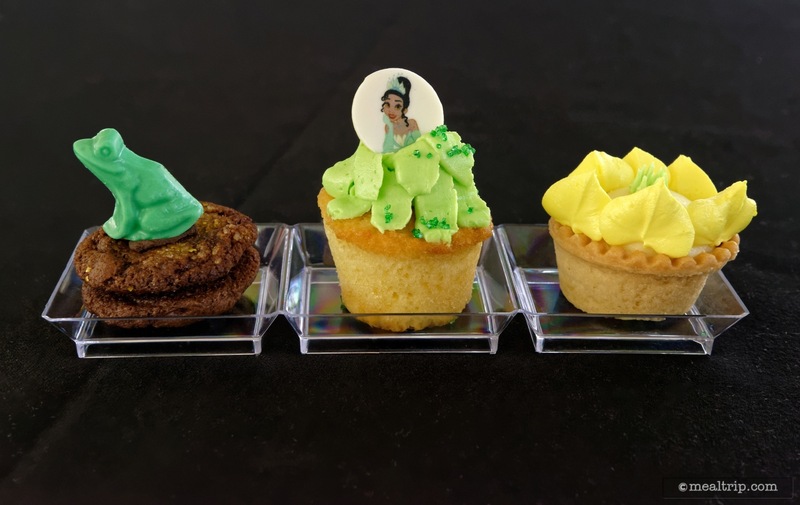 The afternoon mini-dessert party takes place just before and during the Festival of Fantasy Parade and includes a couple of meet and greet photo opportunities with Princess Tiana and Naveen. After checking in at the podium you will be given a little sticker to attach to your clothing which acts as your "pass" into the area. If you have to use the restroom at any time during the event, you will need your sticker to get back in… there are no restroom facilities on or near the event space itself. 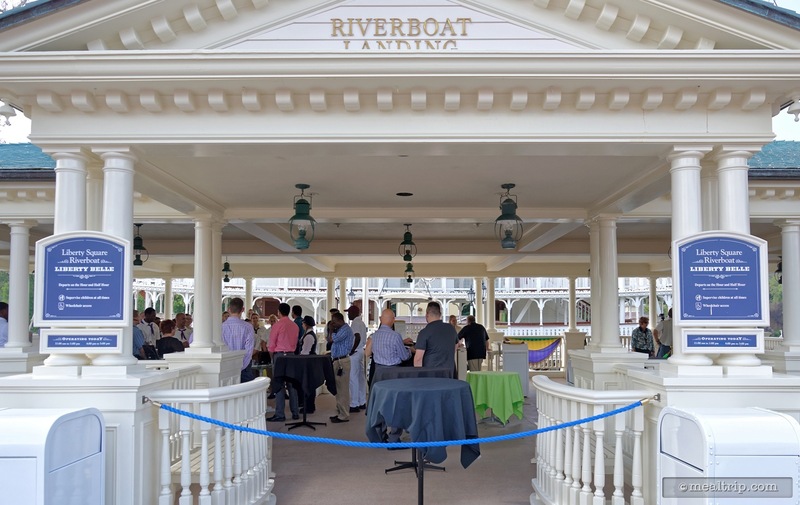 Once inside, the bulk of the ice cream and dessert party takes place under what is normally the "loading dock" area for the Liberty Square Riverboat. The already small area is made smaller with the addition of large ice cream and pastry refrigerator units and staging tables for the cast to hand out the desserts, a lemonade and drinks area, a few tables for ice cream toppings, and a space for Tiana and Naveen to meet with guests (along with ropes for waiting in line and a photo pass photographer). This only leaves room for eight adult-sized, 30" standing tables for you to put your drink, ice cream and pastries on. If you're 12 or 13 the tables will come up to your collar bone, if you're under 9, you probably won't even be able to see your desserts. I guess that's why there's a discount for children… the view is much worse when you're small. I've never really understood Disney's aversion to chairs or even (seemingly) any consideration as to how you are supposed to eat and hold a spoon, ice cream, cupcakes, a drink, and mind a child without having a place to "be". The eight small standing tables are simply not enough for the number of guests that are at the event, and I saw multiple occurrences of families of four and five sitting on the ground and using a wall, bench, or trash can as a table top. With a typical family of four parting with $165 (with tax) for the experience, it's just not an acceptable "special" environment. Tiana and Naveen make an appearance in this "launch/dock" area to meet with guests and pose for photos. A photo pass photographer is on-hand or you can use your own camera/phone. I believe small autograph cards are also available, however I was never given one. I do have to say, our Tiana and Naveen were the real highlight of this first bit of the event. They were great looking, and stayed in character the entire time. 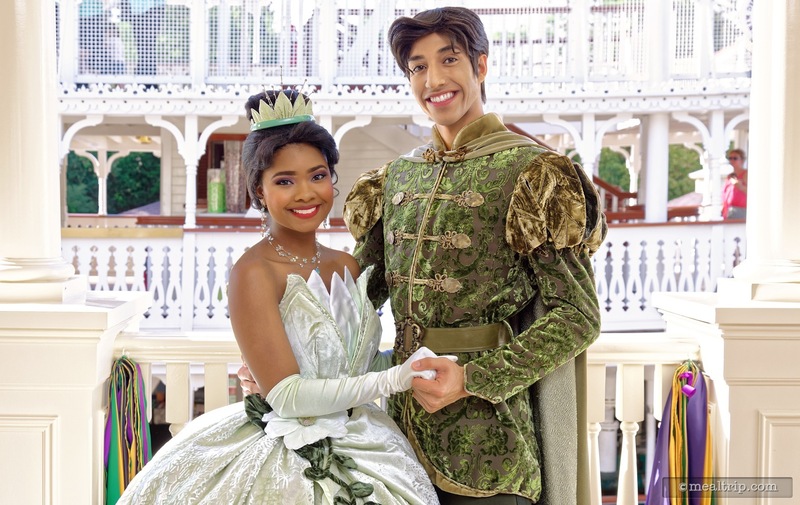 Two thumbs up for Tiana and Naveen! 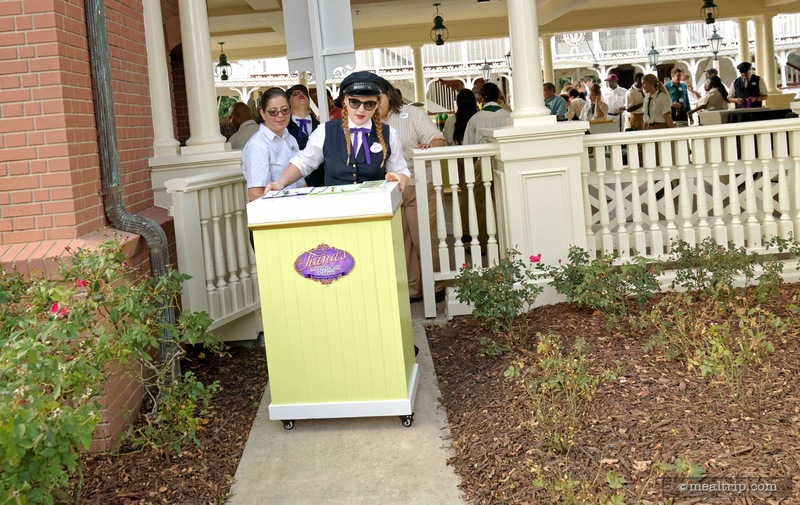 The cast didn't really seem to inform anyone of this next secret, but it seems you can also go on the Liberty Square Riverboat, head down one level to the "exit dock", where you will discover another ice cream and pastry station, with the lemonade and drinks as well. It's a duplicate set up of what's upstairs. While not as picturesque (no views of anything really, no breeze, and possibly diesel fumes) the dessert table is less crowded. There is some additional seating on the Riverboat itself, but it's very limited (and mostly uncovered in full sun). There are some walls near the exit dock, but again, it's not ideal for enjoying desserts with your family. 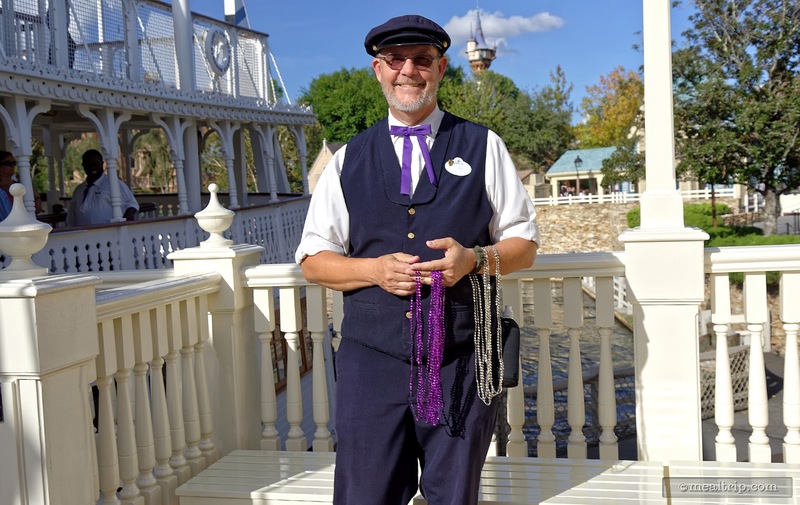 As the time for the parade nears, everyone will be guided aboard the Riverboat where some more treats are available. 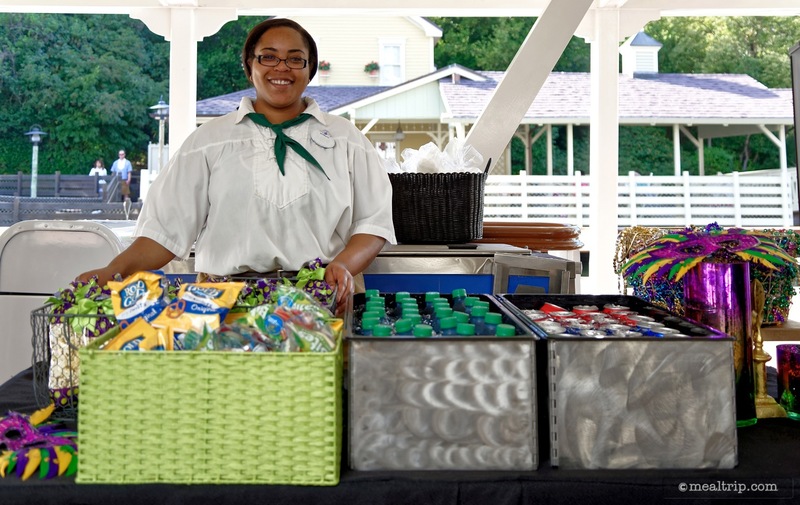 Here you will find the "dry" treats, buttered and sugar popcorn, packaged pretzels, cotton candy and some typical "street kiosk" ice cream treats such as frozen chocolate dipped bananas, berry juice bars and Mickey's ice cream bars. Soda and bottled water are also available. Once everyone is on board, the Riverboat pulls forward a few feet (because you can't see the parade through the dock building), and the Festival of Fantasy Parade beings. No, it's not like sitting or standing street-side. It is a different view. The fine details of the parade mostly get lost, but you can hear the music just fine. I don't really think it's going to hold a child's attention like being right there in the middle of the action though… it's all just too far away. After the parade the Riverboat backs up… Tiana and Naveen get aboard once again… and you set sail for one trip around Tom Sawyer's Island. This is another opportunity to grab a shot of Tiana and Naveen on the deck of the boat with some foliage as a backdrop this time. Here again, the real stars of this segment of the party are the two characters, (they are actually the same people from before... for continuity sake and whatnot). This is also your last opportunity to grab a bottle of water or can of soda, and maybe take a bag of popcorn for the road. Once the boat docks, there's very little time and guests are scooted off quickly. Park operations apparently wants their boat back, so as soon as that landing walkway hits the pavement… the event is over. Backtracking to the first part of the event, the "ice cream and pastry" segment… the pre-scooped portions of ice cream were quite good. Not a watered down ice cream by any means. At the very beginning of the event, the ice cream was solid… after about a half hour, the pre-scooped dishes were starting to melt quite a bit. They are stored in large commercial chiller units, but the constant opening and closing of those doors takes it's toll on ice cream. The couple of items that you could shake onto your ice cream (i.e. toppings) were a nice addition and fairly easy (although more pretty than flavorful). I really didn't see too many people struggling with the syrups that were on the table. The small cups of ice cream really didn't have much room in them for syrup, and here again, you've only got one or two hands to work with and basically no space to put anything down. The dessert trio of pasties have been created just for this event, and were all quite good as well. Nothing that's going to rock your culinary world, but a step above the "made by the hundreds" cupcakes you can find elsewhere. 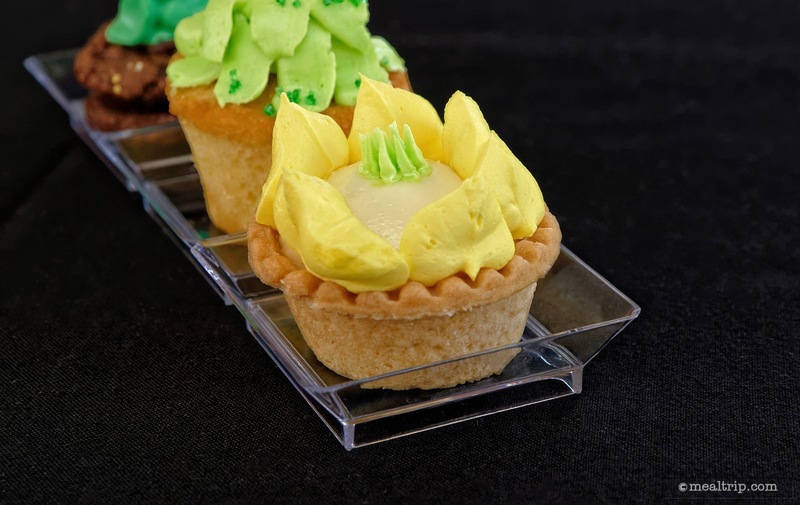 Still, two of the desserts, (the Yellow Sponge Cupcake and the Cream Filled Tart), have a very similar flavor profile. The tart was technically not more "tart" and in this case, only meant that the pastry shell the dessert was in, gave you a bit more crunch than the spongy cupcake. 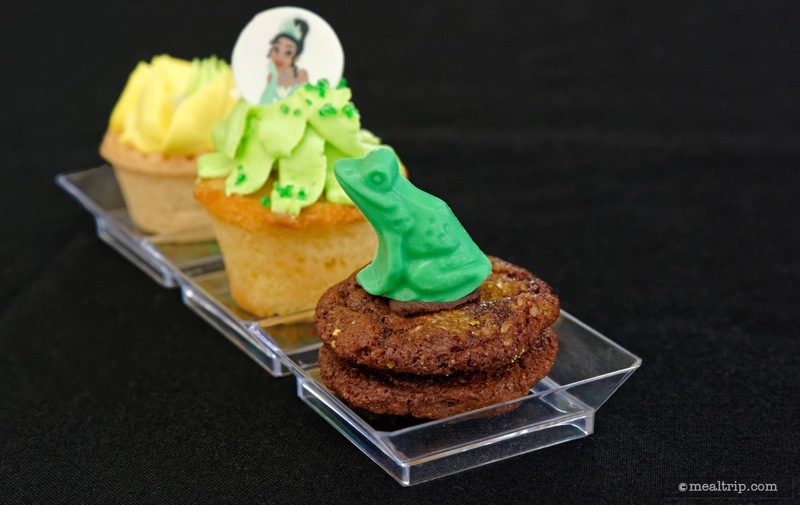 The surprise of the trio was the Chocolate Cookie Sandwich topped with a Green Chocolate Frog. The cookie had a good snap to it, large granulated sugar to add to the crunch, and a dark, rich, chocolatey filling. 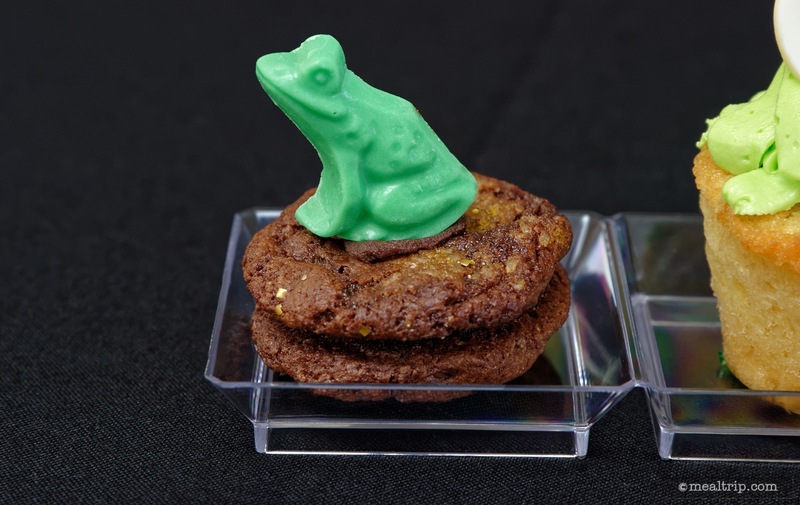 Green Chocolate Frogs, are what they are… but this cookie was the real treat for me on the pastry tray. 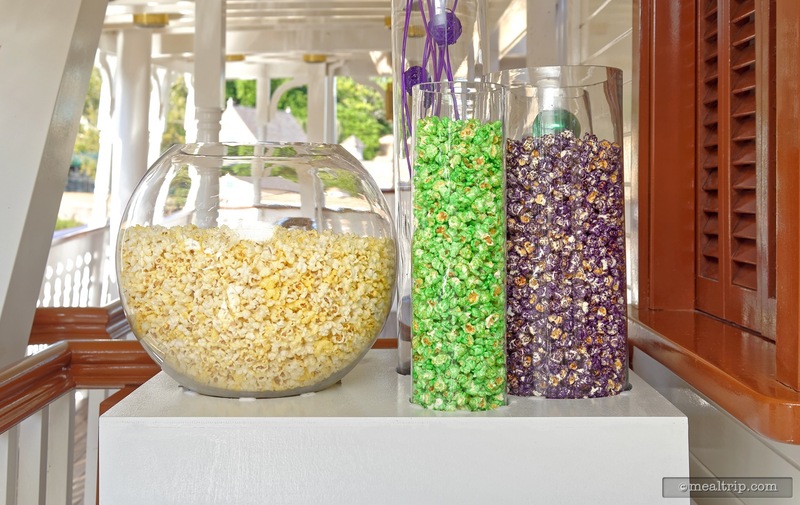 The popcorn available on the Riverboat was fresh and it was nice seeing the full compliment of street-level pre-packaged ice cream bars available as well… although by this time, you are already quite full of desserts. This is where I really struggle with this event, on two levels really. There's nothing here (with the exception of the three pastries) that you couldn't experience just by waiting in line or purchasing separately. Not only that, but you'll probably get a better view of the parade from… well… just about anywhere else but on the Riverboat. It's a unique view, to be sure… and if you're on a quest to see the parade from every angle available, it's great! But it is all just too far away to even keep small children focused on the thing… you're not watching the parade, you're watching trees and people and… okay… I'm bored. 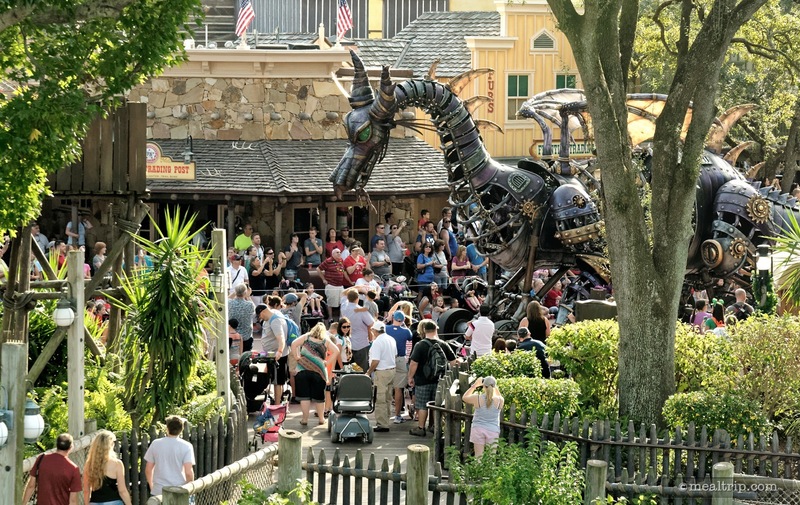 On a second level, give me a freaking chair or at least a place to stand where I don't still feel like I'm in the middle of an overcrowded theme park. That's really why I'm giving you $49 isn't it? Well, it should be. 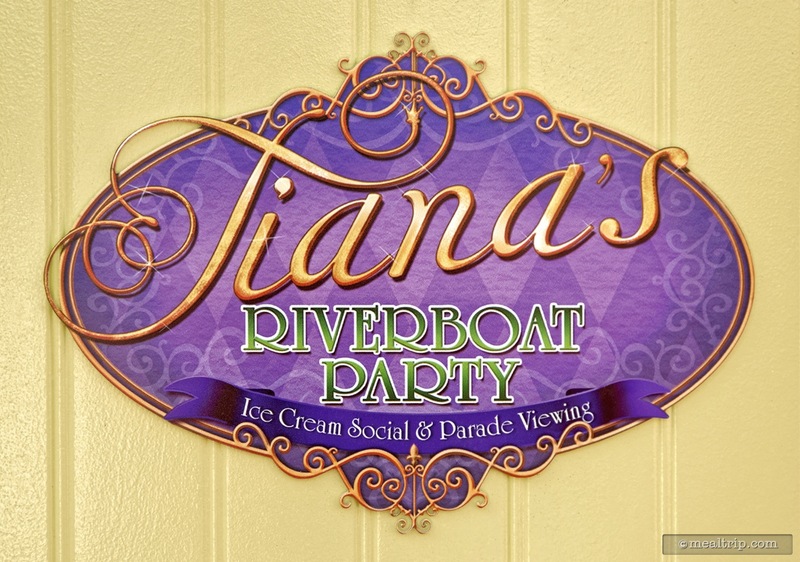 Go get yourself an ice cream, and sit in the middle of a walkway or under a trash can anywhere in the Magic Kingdom, and that's about what the first 15 minutes of Tiana's Riverboat Party felt like. It was only after half of the guests boarded the Riverboat that it felt like you could actually swing your arms around without hitting someone. I don't have an issue with paying for special, as long as it's actually special in some way. That's "the" thing I'm looking for in an extra-cost event. The three pastries, while being good, aren't really enough for me to recommend this event. In fact, in some ways... trying to pour caramel sauce over a melted bowl of ice cream, while holding a trio of cupcakes on a little plastic try, and a lemonade, and a spoon and napkin, while taking care of a couple of children, all in a very tight space… is in fact... more work than you would ever expose yourself to just being out in the park. 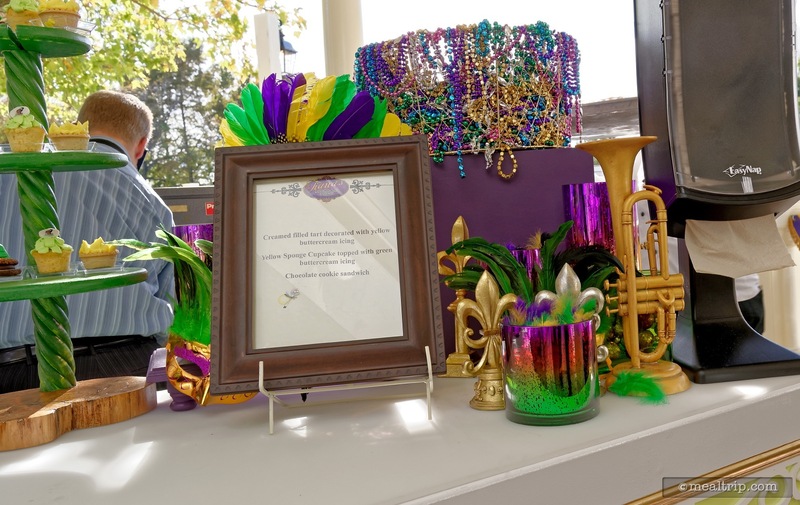 Be sure to check out our photo gallery of the event and see for yourself what Tiana's Riverboat Party and Ice Cream Social is like. CLICK HERE to view all 37 images in our photo gallery.